The 2017 Dunlop MSA British Touring Car Championship fires into life at Brands Hatch next weekend (1-2 April) with the most successful grid in its history, as an extraordinary 16 race-winners and a host of challengers get set to battle for the most coveted prize in British motor sport. A capacity 32-strong field tallying an astonishing 329 victories between them – the very best touring car talent – will take to the 1.2-mile Indy circuit in front of what is always a huge crowd at the famous Kent venue. Honda’s Gordon Shedden clinched the crown after a breathless end to 2016. In a tussle between eight drivers heading into the final weekend, it was the Scotsman who prevailed to take his third BTCC title. He faces a daunting challenge if he is to retain it this time around as he bids to make it a record-equalling three in a row, matching Andy Rouse’s efforts more than 30 years ago. There are two new manufacturer entries on the list for 2017, with Vauxhall making its eagerly-anticipated return and the famous colours of BMW joining the fold, ready to contest the honours alongside Honda, Subaru and MG. A a host of further outfits will be in the fight for outright Teams’ glory. 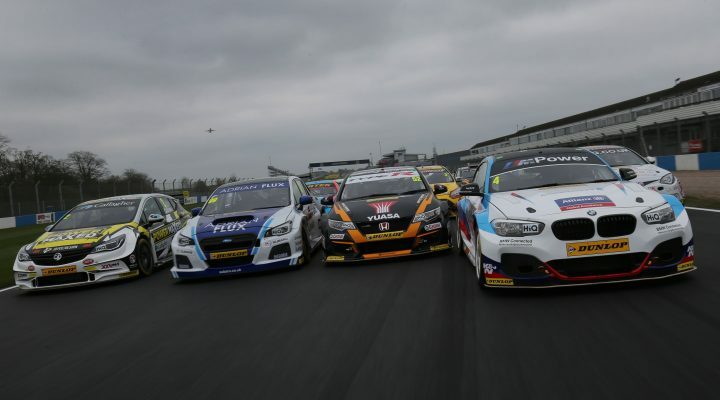 The BTCC will again comprise 30 races across ten events at nine different venues around the UK. All of the action will be played out in front of an audience of hundreds of thousands of fans trackside and many millions more watching live and free-to-air via the championship’s long-term partner ITV on ITV4, ITV Hub and online at itv.com/btcc alongside extensive highlights programmes. Five manufacturers will take to the grid this season, with BMW and Vauxhall making their much-vaunted returns to Britain’s biggest motor racing contest. They will compete alongside Honda, MG and Subaru – the latter looking to build on a storming debut season which sets the bar high for the new boys. Gordon Shedden is the champion incumbent and is back with Honda – as is long-time team-mate and fellow triple-champ Matt Neal. With an intensive winter testing programme and a chassis-engine-driver combination proven many times over, there is no reason to believe Halfords Yuasa Racing’s challenge will in any way weaken. The newly-liveried stealth black Civic Type R with signature orange flashes is certainly the car with the target on its rear bumper. On its return, BMW aligns with West Surrey Racing – running a trio of 125i M Sports. The addition of factory support from the Bavarian giant has only served to galvanise WSR’s bid to hammer home its authority as the current Manufacturers’ and Teams’ title-holders. In a move that will surely have sent shivers down the spine of many of the Northern Irishman’s rivals, rear-wheel drive specialist Colin Turkington has re-signed for the team – one that made him a double champion in 2009 and 2014. Rob Collard has agreed a new deal with the Surrey squad, while reigning Independent Drivers’ champion Andrew Jordan joins the stable under the BMW Pirtek Racing banner. All three challenged right down to the wire for last year’s overall Drivers’ honours. Subaru’s first foray into the BTCC in 2016 threw a cat amongst the pigeons, with the Japanese marque making a quantum leap forward mid-season, as both Turkington and Jason Plato vied for race wins on a regular basis. The former has since moved to pastures new, but Plato remains. The series’ record race-winner is hungrier than ever for a third title. In practically every season since 1997, his inaugural campaign, Plato has been a top three contender. ‘JP’ will be joined at Adrian Flux Subaru Racing by Jack Sears Trophy champion Ashley Sutton – a bright young prospect who enjoyed a stunning rookie year in 2016 – as well as James Cole and 18-year-old Renault UK Clio Cup graduate Josh Price, one of five newcomers looking to conquer the JST this season. Power Maxed Racing’s Vauxhall Astra is one of the most intriguing propositions in the pack, with Tom Chilton reigniting his BTCC career six years on from his previous stint. Alongside the Surrey star will be Senna Proctor, who – like Price – will make his BTCC debut at Brands Hatch next month as he jumps up from Clio competition. MG has undergone something of a transformation over the winter with Aron Taylor-Smith and Daniel Lloyd forming its new-look driver line-up. Taylor-Smith is a multiple race-winner while Lloyd offers young promise, having shown glimpses of his raw pace at a couple of race weekends last season. Looking to pick up from where they left off at the end of a watershed campaign in 2016 will be Motorbase. Following its maiden titles, the Independent Teams’ champions field Shredded Wheat as their new headline sponsor and will run three striking yellow Ford Focus STs. Stalwart Mat Jackson resumes his longstanding relationship with the Kent-based squad, with Martin Depper and rookie Luke Davenport completing the triumvirate. The outfit will be looking for home comforts at Brands Hatch, and will surely be able to count on strong backing from the grandstands. At Donington Park’s official test accompanying the BTCC Season Launch in mid-March, the top seven times were set by Independent teams – perfectly illustrating how competitive the championship continues to be, and that Independents can more than mix it with the Manufacturers. Tom Ingram’s Speedworks Motorsport Toyota Avensis provided the benchmark time – underlining his potential, evidenced last year most notably with two race wins and a brace of pole positions. Handy Motorsport’s Rob Austin, also wielding an Avensis, will be looking to build on a strong second half of 2016 after finishing just 0.1 seconds shy of the best on offer at Season Launch – an encouraging sign. Another 2016 race-winner – including the Brands Hatch Indy opener no-less – hoping to step up to the next level is Adam Morgan. The Lancashire racer will be pushing to make good on work behind the scenes at Ciceley Motorsport, with newly-acquired Mac Tools backing adorning its beautiful Mercedes-Benz A-Class. Aiden Moffat in the sister Laser Tools Racing Mercedes has edged consistently closer to the front of the field and now has the top step of the podium firmly in his sights. New chargers, BTC Norlin Racing started in the best possible way with two top ten times at Season Launch. Chris Smiley placed his striking grey Chevrolet third with Dave Newsham, making a full-campaign return to the BTCC, ninth. The name is new but the backbone of the team has experience, having previously competed in the series between 2006-2008 and again in 2014. The aim will be to spring a surprise or two, and that certainly isn’t out of the realms of possibility. Jack Goff has traded rear-wheel drive for front-wheel drive with a move to Eurotech, partnering Jeff Smith in the squad’s brace of Honda Civic Type Rs. Team HARD, meanwhile, has traded its trio of Toyota Avensis’ for three Volkswagen CCs, with Jake Hill remaining on-board to pilot the TAG Racing entry and fellow returnee Michael Epps driving one of two Autoaid/RCIB Insurance Racing-branded cars alongside rookie Will Burns. Matt Simpson is preparing for his second season in his eponymous Simpson Racing Honda Civic Type R, which is now being run by Honda powerhouse Team Dynamics. Two-time race-winner Stephen Jelley is a welcome ‘comeback kid’ eight years on from his last BTCC start as he lines up for Team Parker with Maximum Motorsport alongside Josh Cook, who claimed a brace of rostrum finishes in 2016 and is chasing his first victory in the series. Ollie Jackson is back in AmDtuning.com with Cobra Exhausts’ distinctive Audi S3, and he will be joined by reigning Renault UK Clio Cup Champion Ant Whorton-Eales, who will be eager to make a speedy impression. The BTCC’s Next Generation Touring Car (NGTC) regulation refresh is complete, with the entire grid carrying the latest RML chassis, suspension and components for the first time in 2017 while an all-new TOCA powerplant has also been introduced. The resulting upturn in performance will be bolstered by Dunlop’s new range of bigger Sport Maxx BTCC tyres – the series’ title sponsor forecasting lap times may now be as much as a second per lap quicker. A quartet of local teams – Motorbase, Team HARD, AmDtuning.com with Cobra Exhausts and West Surrey Racing – will be hoping to impress at Brands Hatch. Fresh off the back of its titles with then-driver Andrew Jordan sealing the Independent Drivers’ laurels and the team itself comprehensively clinching Independent Teams’ honours, Motorbase will be looking to continue its form into the new year. Team HARD and AmD, meanwhile, both showed flashes of form in 2016 and will be eager to shine on home turf. A strong start will surely be an expectation for those at WSR, now with BMW backing. TAG Racing’s Jake Hill is Kent born-and-bred, AmD man Ollie Jackson hails from Reigate, Surrey – as does Tom Chilton – while Matt Simpson is West Drayton-based, meaning all four of them count Brands as their BTCC backyard. The opening race weekend of the 2017 Dunlop MSA British Touring Car Championship begins on Saturday 1 April, with the entire race day on Sunday 2 April broadcast live and in high definition on ITV4. Those in attendance at the circuit can stay in touch with the commentary and live timing from every session, available at btcc.net/live over the whole weekend. In addition to the BTCC, the support series on the TOCA package are set to deliver even more action to the fans at Brands Hatch. Sportscar fans will get their fix with races from the Michelin Ginetta GT4 Supercup, Porsche Carrera Cup GB and Simpson Race Products Ginetta Junior Championship. The Renault UK Clio Cup – often seen as a stepping-stone to reaching the BTCC, with three new graduates this year alone – will also feature on the huge bill of British racing, as will the F4 British Championship. Tickets for the Dunlop MSA British Touring Car Championship season-opener at Brands Hatch (1-2 April) are available from £27 for adults, with free entry for children aged 13 and under. For more information call 0843 453 9000 or visit www.brandshatch.co.uk. All admission includes access to Sunday’s autograph session with the BTCC drivers in the pit lane, as well as free parking.